Can this Republic of Gamers mobo justify its astonishingly high price tag? The Maximus packs a Bluetooth overclocking interface. Yes, really! Within the relatively small self-building segment, the market for high-end boards with full-on feature sets and pricing to match is itself a minority sport. What to make, therefore, of the imposing Asus Republic of Gamers Maximus III Extreme? Pricing wise, it sails straight past expensive, pauses briefly at exotic and settles finally for punitive. The price tag of £265 is a huge amount for any motherboard, but in the context of a board with the mainstream LGA1156 socket, rather than the high-end LGA1366 item, it looks, well, unsustainable. At the very least it finds itself in a tiny niche. It had better be bloody good. In terms of features, it's more than good. It's nothing short of stunning. The most spectacular capability is, undoubtedly, the ability to apply BIOS tweaks via Bluetooth using a compatible mobile phone. That's right, you can overclock this motherboard wirelessly using any Windows Mobile, Symbian or Android handset. An iPhone app, meanwhile, is in development. As it happens, you can also use your phone to do more mundane tasks such as control media playback. Another funky feature, known as ROG Connect, allows you to hook up a secondary PC, be it a portable or desktop system, via USB and remotely edit BIOS settings even when the system is powered down. Then there are fully five PCI-e x16 slots and support for either four-way CrossFire or three-way SLI courtesy of the extra PCI-e lanes provided by an Nvidia NF200 chip. Next up is SATA 6Gbps support, a pair of USB 3.0 ports and 10-channel audio; not to mention dual BIOSes allowing you to slap on custom or beta versions with zero-risk of motherboard death. Frankly, all of the above is no more than a whistle stop tour of the main highlights. 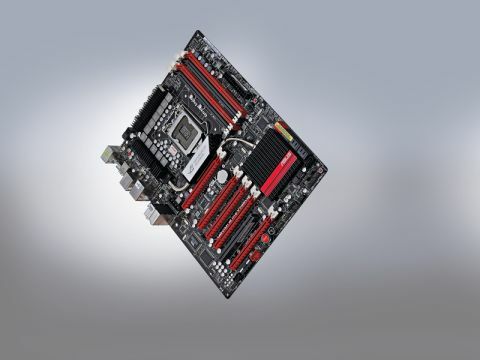 We could write a small novel about this mobo's bonkers feature set. It's also a truly beautiful physical specimen replete with effective and elegant heat sinks and cooling pipes. Anyway, if you're beginning to think that £265 sticker isn't quite so silly after all, you're in good company. But does it deliver in terms of performance? Somewhat disappointingly, it doesn't top our overclocking table with the base clock running out of steam at 195MHz and therefore a maximum frequency of 3.9GHz for our Core i5 test chip. That said, we've little doubt that this motherboard will deliver the goods in the hands of a patient and dedicated enthusiast. But it's worth noting that it doesn't provide an advantage in the quick and dirty overclocking stakes. All of which makes the Maximus III an incredibly desirable but ultimately hard-to-justify novelty.